Rebeccah Carroll, a recent Master of Social Work graduate from Samford University’s School of Public Health, knows what it’s like to experience the joy dogs can provide to those who are hurting. 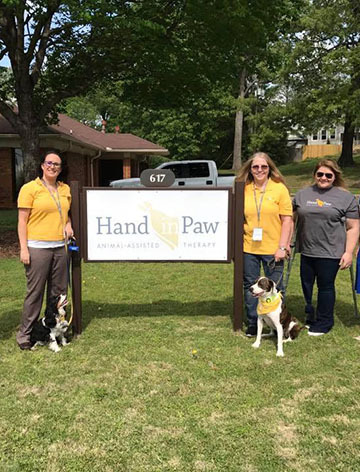 It was her own experiences that led to her internship with Hand in Paw, a nonprofit organization that provides professional assisted animal therapy to more than 100 organizations in Birmingham, Alabama. All Master of Social Work students at Samford are required to complete 500 internship hours in their final year of the program, and it has proven to be an opportunity for students to make a true impact on a community. Carroll’s experience is no exception. During her yearlong internship with Hand in Paw, Carroll wrote, trained and implemented a new program involving assisted animal therapy during times of trauma and grief. The program addressed the organization’s need for volunteers with formal training on how to work with those who have experienced traumatic events. “This project with Hand in Paw really paired perfectly with what I have studied the most and loved the most in social work,” Carroll said. She found that her passion for helping those affected by trauma, her love for dogs, and her education and skills in social work prepared her to write the program and train volunteers to help those in crisis. To implement the program, Carroll conducted three training sessions with 65 volunteers. Although the dogs, not the volunteers, perform the therapy, Carroll saw the need to train the volunteers on how to assist their dogs better, and how to be emotionally available and ready for the individuals. The trauma and grief response program has a focus on adolescents, working with many Birmingham-area school systems, and it is designed to help individuals who have experienced the death of a loved one, disasters, pain, health issues and loss. Carroll said that one of the most important elements of the training is teaching volunteers what they should and should not say. “People might think it is obvious, but when you are actually in the situation, you find yourself saying things that are not helpful to someone who is experiencing grief,” Carroll said. Let the person cry and deal with his or her emotions. Be present. Know that you cannot fix the situation or the person, but you can be available. It’s okay to sit in silence with the person and the animal. Carroll emphasized the importance of realizing people affected by trauma and grief must come to their own reasoning and understanding. An explanation for their pain cannot be given to them by anyone but themselves.